Now that it's the school holidays I felt like how I used to feel on Tuesdays when I had Kien with me all day. Depending on what time of the day, it was either the best thing ever, or when the heck is Jef getting home so I don't have to deal with this kid's whining anymore! On Tuesday I experienced both of those phenomenons, and my only solution was to take him out and burn off as much energy as possible. So we set out early (as soon as the first whine occurred, basically). If you haven't gathered already by the many posts in the past, I love Cornwall Park. I forget just how beautiful it is until I go back and then I love it even more. Kien on his bike, me and my running shoes - perfect situation for exercising. We did a nice loop which we both enjoyed consisting of tracks, side walks and some off roading. It didn't take long and we covered a good distance. Kien wasn't keen on pushing for the summit, although I told him I would push him all the way up the volcano. I had told him we could go climb another mountain if he was not tired, and he was enthusiastic about that. Well it's not exactly a mountain but it's fun nonetheless, and it's close to my dad's restaurant where we were planning to have lunch. It is a mixture of farmland and bush, and is really easy to walk. He collects "treasures" along the way and wants me to take pictures of them. After the walk we got to my dad's for a late lunch. They usually have a giant bag of feijoas for Kien since they know how mad he is about the autumn fruit, but they didn't know we were coming so didn't have any. To keep us in full supply for a week we drove over to dad's house and got a bucketful of lovely, fat and juicy beauties. 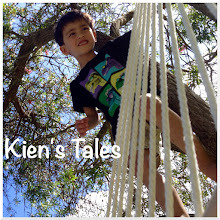 Kien was so happy!